Married in 1865 Herman and Lily Munster had a love that was timeless. 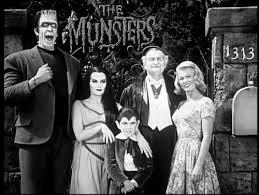 With Universal Studios as producer, The Munsters were able to use classic monster images to which they added running gags, including the central theme that they considered themselves just an average, middle-class family to make a typical sitcom into a brilliantly campy classic. 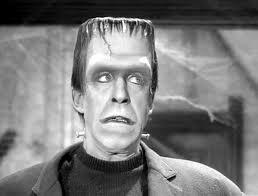 Fred Gwynne as Herman Munster, Frankenstein’s monster/joke-cracking suburban Dad was electric. Yvonne De Carlo as a blood-sucking Donna Reedesque PTA Mom was inspired. Add cool cars, pets, a young werewolf, older vampire and of course, the family oddball, the ‘plain’ niece, Marilyn, and they had a runaway hit. 1313 Mockingbird Lane has been used in many TV series and movies in various forms including Desperate Housewives. Spot was alleged to be a fire-breathing T Rex, not a dragon. The Munsters and The Addams Family ran concurrently, 1964-1966. The Munsters had higher ratings, but was knocked out by Batman, in colour. Kapow! Fred Gwynne and Al Lewis were in Car 54, Where Are You? together before The Munsters. Gwynne says “Car 54, Where Are You?” in the Munster Go Home! film. Herman worked at Gateman, Goodbury & Grave Funeral Parlor. The spooky John Carradine played Mr. Gateman. Fred Gwynne continued acting, including Jud Crandall in Stephen King’s Pet Semetary (I guess you could say Gage was his Achilles’ Heel) and who could forget his conversation with Joe Pecsi about the ‘yutes’ in My Cousin Vinny. Pat Priest replaced Beverley Owen as Marilyn Munster after episode 13; the two were so similar most people didn’t even notice. Butch Patrick played himself, dressed as Eddie Munster in The Simpsons in 1999. Fred Gwynne’s costume weighed about 50lbs and filming in black & white they had to use violet face paint to catch the light. The Munsters did have a certain built-in charm. Next Post Supernatural Calgon Take Me Away! I Introduced my son to The Munsters thanks to Netflix. He thinks the show is hysterical and likes to binge watch when I’ll let him. My Fair Munster – This is an excellent show. It was so nice to hear all the things that Donna said about the characters! Oh this brings back a host of happy memories! 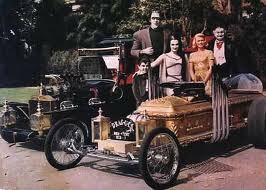 I LOVED The Munsters as a child… Who else remembers them? Wonderful fun post, D. And perfect with Halloween right around the corner. Hugs.